When sitting down with Chad to talk about his art and his involvement at Sunset Terrace it becomes quickly apparent that his humorous outlook on life translates into his art practice. His name is shared with teenage heart throb Chad Michael Murray, and he is quick to point out the difference with his name. Our conversation covered this important distinction, and then moved into logistics, and why I was there. I was there to talk about art. I first encountered Chad in late August 2014 at his solo exhibition entitled Optimysticism at Avenue. Avenue is located at Main and Hastings, and is usually bustling with suspicious activities outside the front doors. Walking from the hot, overwhelming street into Chad’s dimmed, cool show was quite the juxtaposition, and his art had an immediate calming effect. His unique work has influences from surrealism to digital media, and he utilizes many mediums in his practice. I sat down with Chad one rainy afternoon and we talked about practicalities such as art, and obscurities such as space and Martians. Here is what he had to say about his practice. So tell me about your practice in the last year, what have you been up to? The past year, I guess I’ve done a lot. 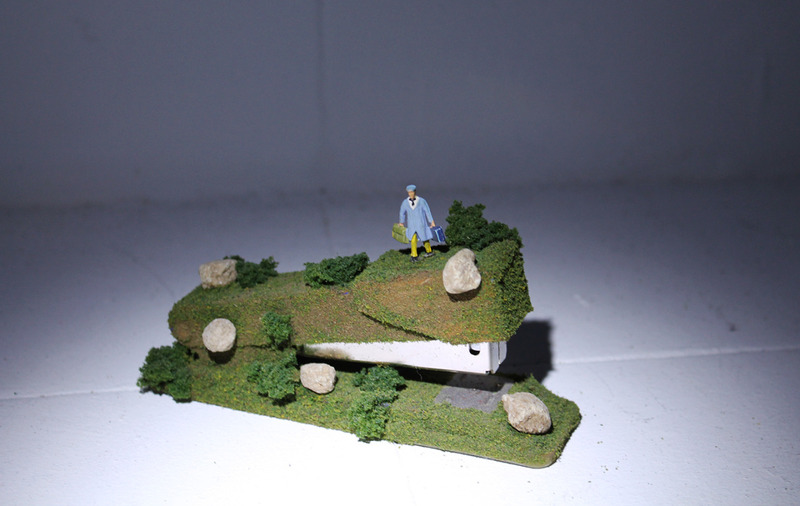 I had a solo show at Avenue called Optymysticism where I made a bunch of sculptures using miniatures out of everyday objects such as a roll of scotch tape that were modeled as these miniature landscaping features that you would see in a model train set. The whole exhibition was in the dark so it required flashlights to see. 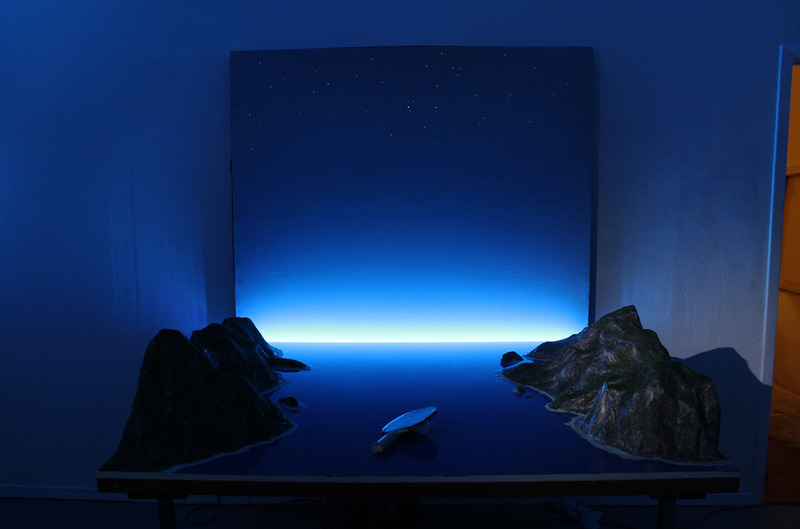 I made a Ping-Pong table that is also an illuminated ocean sunset that you can play on. The whole exhibition was operating on different scales. I’ve been painting a lot also, and had a solo painting exhibition at Robert Lynds Gallery back in October. Earlier in the year I was working on a bunch of skydiving paintings that will be part of a larger project. Speaking of painting, you work with a number of mediums, but have mentioned specific interest in painting in previous conversations. What about painting is alluring to you? I guess it comes down to mark making. If I had never been in to making marks as a kid, maybe I wouldn’t paint today. I feel like the more you think of it, the more painting is not really that alluring. The more I think about what art is capable of, it is so seldom something that happens through painting alone, or from what happens from looking at painting. We see images all day long, where painting gets its power from if it has any is from it’s place in these images. With that being said, I’ve always loved making pictures. Ever since I was a kid that was an interest. I think despite the over saturation of images we are exposed to, mark making is so fundamental to being a person. I think that what is interesting is this combination of the claim that painting is dead – even though I don’t think that is necessarily true- mixed with the other hand of the pureness of human expression. I’m kind of jaded by painting, but also excited about it. I am excited about trying to not look at a subject directly. I like to hide a subject in something that is vague yet familiar. 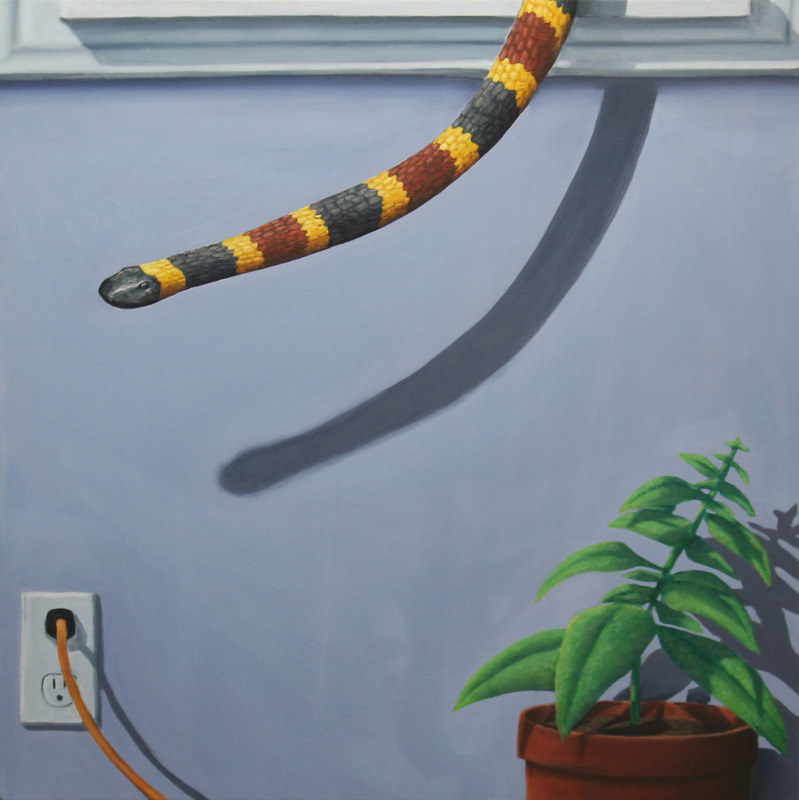 The paintings I like to work on are alluding to something that is going to happen while not unveiling it. Do you think painting provides a starting point for your process? When you have a concept or for a piece do you start with painting? I don’t tend to start painting unless I know what I am going to paint. I see that a lot of my studio mates at Sunset Terrace are much more material driven. Obviously with painting the material is always present, but their practices are more about exploring as they go. For them it’s like you don’t really know where you are until you get there, and then once you are somewhere you do something based on your previous action and continue moving forward that way. Me on the other hand, when I try that process it feels so contrived. I can’t think that way. I think of the end image and labour until the image is as done as I want it to be. Humour seems to be present in a lot of your work, or at least if it’s not humour it’s a sense of absurdity, what brings the absurdity or humour into your work? Humour as a part of my process is thought of after. When I think about the value of a joke, or what you could call a joke, it deals with some understanding that you have of the world around you and the joke shifts that understanding. This can be through language or art. One of the most valuable things that art can do is take your understanding of something that you totally take for granted and shift it slightly to see it like you never really thought of before. When I see something that manages to shift your perception, laughter is the first emotion that makes sense to me. People either laugh or cry. I’m more into laughing. Your art has a sense of digital media, without being digital in nature, how does digital media influence you? I was thinking about that recently actually, analogue approach to creating art that at moments has aesthetic of Net art. I’m really drawn to that, creating something that aesthetically looks like it belongs on the Internet, but then letting it exist in the real world in some way. As far as direction, that’s ultimately where I see myself going even more in my art. I find the surreal use of light and the use of miniatures seductive and similarly it is something that you see in net art. Jon Rafman did a project called 9-eyes with Google street view. In the project he digitally cruised around using Google street view and then blogs the interesting images that have been taken with Google street view cameras. He has managed to find these moments of humanity in this robotic way of documenting the world. Rafman also talks about Second Life extensively as this free uncritical platform for creation that happens within the game. In Second Life there are also these incredibly beautiful virtual tours of digitally created landscapes. This is something that I was very inspired by, although, because it was in the digital world it didn’t really make sense to me but it’s obvious that this is where some of my influence comes from. We are all sponges, whether or not you are working in a specific medium, you are exposed to the different media all day long. Different media is how we see things. Definitely, the digital world allows for anything. Within that framework anything can exist which is something that many surrealists were trying to do as well. You have a studio at Sunset Terrace and are very involved with their organization, how did you get involved with sunset? I got involved right at the beginning. Maya Beaudry, another artist at Sunset Terrace, was cruising Craigslist at 3am one morning and found an empty warehouse for rent. She contacted about a dozen of us and asked if we were serious about getting the space. At the time I had a space down by Main and 2nd avenue. We decided to try and get the space. The first night was crazy, we had keys to get in the backdoor but the gates were still locked. All of us jumped the gate and opened the warehouse. We sat in our new space and started dreaming about what to do with this thing. It was kind of a slow start to get Sunset Terrace off the ground because most of us were still in school. It’s in full swing now, two years after we got the space. We have a show every three weeks, often there are events to do with music and the events don’t necessarily have to be an exhibition. It’s nice to keep the space relatively free so if someone has an idea it can be done. Studio and Gallery spaces seem to be a strong place for artists to gain experience as practicing artists or networking in Vancouver, do you consider your involvement at sunset terrace as an important part of your practice? Yeah, totally. It has been really interesting to see the space evolve. There is constantly something to be excited about. It seems to be that someone from Sunset Terrace will have an exhibition and you show your support. It used to be more frequently but has been less frequent lately. About a third to half the exhibitions at Sunset Terrace are artists who have studios there. Its really nice because you get to see the things that your studio mates have been working on suddenly come together. Sometimes you get new faces. For example, Gabrielle Hill who recently showed here. By spending time around artists while they set up, you establish a community. Openings are usually very warm and inviting too. Avenue is another space that has such a good vibe to it. I like being able to go to these studios and check out the art in the gallery space, then move to the workspace and be able to see works in progress. The process becomes visible to you it’s not as isolated. There is the finished work in the front and then the works in progress in the back. What is up next for you? Do you have any exciting things you are working on? Yeah actually, as I mentioned before, over the past year i have been working on a bunch of skydiving paintings. I am going to start a Kickstarter project to fund a skydiving trip and use these paintings as rewards for donations. There will be a media package that the skydiving company offers you when you jump. It’s a video of you skydiving and they put it to whatever extreme skydiving soundtrack that is appropriate. I am imagining to have this video as exchange for the experience. Maybe an exhibition will come of it, but that’s what i’ve decided. March 1, 2015. That’s when I want to launch this project. 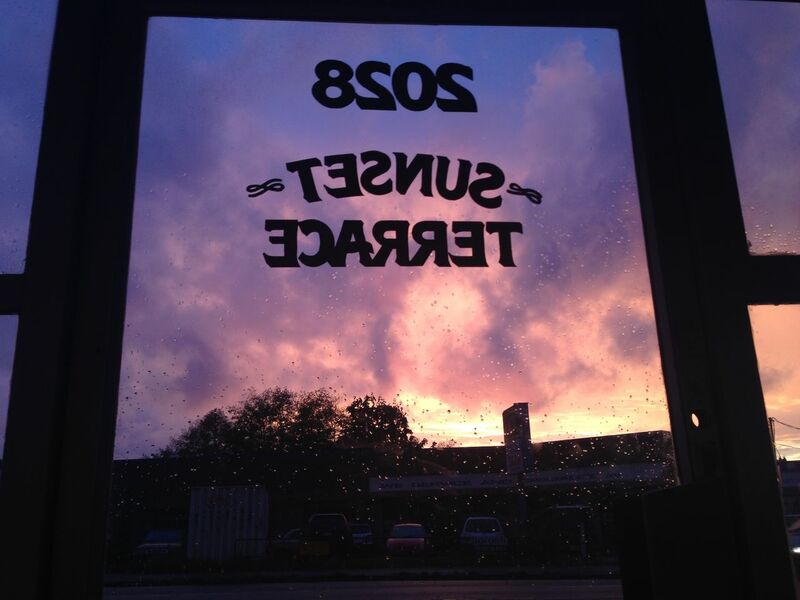 For a list of Sunset Terrace artists and upcoming shows and events check out their website. Chad’s kickstarter can be found here. His tumblr can be found here.